This month I have some tasty food to go with rum and wine, from an unexpected brand. I was too old to be enthralled in the Hello Kitty phenomenon, but my daughter wasn’t. Like many others her age, she is of age to enjoy wine. This fact was not overlooked by Sanrio. The makers of just about everything you can think of with a Hello Kitty logo has cashed in on its aging fans by producing a wine that carries the iconic name. 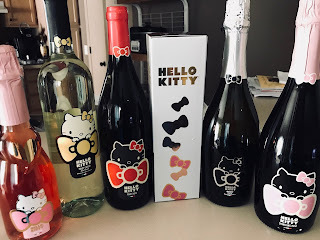 The company came out with an entire line of wines and sent me the Hello Kitty 2018 Collection to check out. With the exception of the Pinot Noir, which I had a fan of the grape check out and enjoy, it’s a collection of what I like to drink. I have to say, they were all done well. The Sparkling Rose just has a touch of sweetness and is mostly fruit forward. If you want something even more flavorful, do the Sweet Pink Sparkling, which will give you more berry and less floral notes. The Hello Kitty Prosecco is another great bottle to have on hand this holiday season. In addition to the conversation starter of the design, it’s a good aperitif for everyone, with light pear and honeysuckle, more dry than sweet. Pinot Grigio is always a safe bet to serve and I love Hello Kitty’s 2018. It’s a ripe green apple, crisp and fruity, but light enough to pair with anything. If rum is more your thing, I was sent two of Cruzan Rums latest, Peach and Tropical. They are a perfect end of summer, served on their own over ice, with some club soda, or in cocktail recipes that will help you forget summer is over and put you on a tropical island – if only for a short while. Combine ingredients in a pint-size glass. Gently stir and garnish with a fresh peach slice. Pour rum, then soda in a tall glass filled with ice. Mix ingredients into a glass of crushed ice. I took a break this month from baking and creating with Pereg naturals grains and flours, to check out their spices. 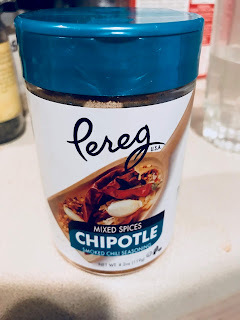 I’m usually not a fan of Chipotle spices, but the Pereg Chipotle is a nice blend of seasoning, without being overwhelming. I decided to give it a try with ground beef. First, to cut out some fat and calories, I finely chopped white mushrooms to equal the amount of beef. I then divided the meat mixture in half and put a teaspoon of Pereg Chipotle in each, blending it in. I browned all of the meat and then drained off the fat. With the first half, I made simple sliders with a package of eight Pillsbury biscuits. I put four biscuits on a cookie sheet and evening divided the meat among the four. Then, I sprinkled some cheddar on top and pressed the remaining biscuits on top of the sliders. Cook as directed on the biscuit package and enjoy your sliders! 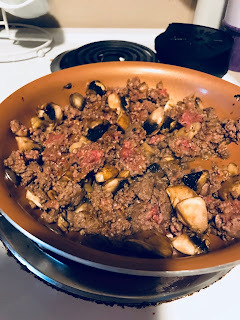 I used the other half of the meat mixture for another quick and easy meal. Simply mix it with your favorite tomato sauce and spread it over cooked rice, spread into a loaf pan. Heat and serve when you are ready to eat (this freezes well). For more of my favorite recipes, including ones I’ve created, check out my Pinterest page.